Two Taraba State local government chairmen yesterday relived how troops aided killer-herdsmen — corroborating an allegation made by former Defence Minister, Gen. Theophilus Danjuma. There are troops in the state under “Operation Cat Race”, the military exercise being conducted to end the killings in the Middle Belt. 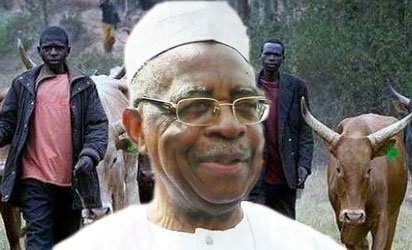 The army has debunked Gen. Danjuma’s allegation, saying it remains neutral in the farmers-herdsmen’s clashes in which many have died. Gen. Danjuma’s advice to Nigerians to defend themselves has sparked a huge row. The Jukun Development Association of Nigeria (JDAN), a socio-cultural organisation of Jukun in Taraba State, Gen. Danjuma’s kinsmen, backed his stand yesterday. Another senior citizen, Itsekiri High Chief Rita Lori Ogbebor urged the government to protect Nigerians. JDAN and Chief Ogbebor spoke at news conferences in Lagos. The council chairmen, who spoke with reporters described Gen Damjuma’s “intervention” as “a way of making the military turn a new leaf”. The Chairman of Takum Local Government, Shiban Tikari, said the army began “Operation Cat Race” on February 15 without notifying him and others. He reported to Governor Darius Ishaku before the army served the governor a notification letter on March 1. “The commencement of the Cat Race has caused resumed attacks and killings by Fulani herdsmen. Many more are now displaced,” Tikari said. Chairman of Ussa Council Rimamsikwe Karma, told reporters that the soldiers were harassing his people, “collecting kitchen knives and cutlasses from them while herdsmen were walking freely with AK-47 riffles, burning homes and killing people without provocation. A widow, Mrs Jumai Andeyaba, told reporters that after she had left home last Tuesday for a funeral, soldiers broke into her home, harassed her daughters and stole her N150,000. Lt.-Col. Ibrahim Babatunde Gambari, the Commanding Officer of Takum Barracks, said he had no authority to react to the allegations. The letter, citing a case of collusion, said some herdsmen who attacked communities in Takum and Ussa local government areas on May 6, last year, were later overpowered by security agents and their 224 cows seized and given to Gambari as a ploy for him to track down the culprits. But Col. Gambari released the cows to the culprits without the knowledge of the governor. Residents of Wukari alleged that a chopper had dropped arms in the pastoral village of Jubu on Saturday night, January 20. “Our governor (Ishaku) had cried out that he received threats that the state would be attacked in 10 days. “10 hours after the governor’s alarm, the killer-herdsmen struck and killed four people, among them a couple. Yet, the killers were not found, and the whole thing was downplayed,” Mr. Noah, a resident, said. According to The Nation, on January 26, 2016 Ishaku wrote to President Muhammadu Buhari, saying: “It is very clear that these attacks can no longer be viewed as inter-ethnic crises. Speaking for the Jukun organisation, Chief Bako Benjamin said majority of Nigerians were unaware of the calamity and that had befallen the Jukun in the last four years. He accused the media of not paying enough attention to “the silent ethnic cleansing and genocide ongoing in southern and central Taraba”. He said rather than lampooning Gen. Danjuma for his candid view, which he said was coming after a thorough analysis of the situation, the military should have launched an investigation into the weighty allegation and fished out the culpable officers and men. The organisation also demanded a Commission of Inquiry to look into several cases of atrocities, human rights violations and banditry committed by some security forces in Jukunland against innocent people. The people, Benjamin said, are being killed by herdsmen and their homes and farmlands burnt. He said Gen. Danjuma’s statement is a reflection of what goes on in Taraba and elsewhere around the Middle Belt, where several villages and towns have been sacked and indigenes chased away by Fulani herdsmen, who invaded their communities, allegedly with the military’s backing. He said parading Jukun youths on Sunday, barely 24 hours after Gen. Danjuma’s criticism of their handling of their roles for taking pictures of the ongoing violence in their land, was “simply exposing the ugly underbelly of the Nigerian military and their complicit in the whole tragic saga unfolding in Taraba State”. ”We are anxiously waiting for when Fulani herdsmen that have killed and wiped off entire villages in our land would be paraded. We have not travelled to anybody’s land to look for trouble, but our people are being arrested in our land for snapping pictures. He alleged that there were widespread reports of glaring bias and nepotism by the Nigerian military’s Operation Ayem Kpatuma, particularly in Takum and Ussa local government areas, since they arrived. “For example, there was no single presence of Fulani herdsmen in the two local government areas for over a year now since their last mass killings of our people, which saw them abandoning the area and fleeing until the soldiers arrived on the same day with them in the name of Operation Ayem Kpatuma. “No sooner had they arrived in the peaceful communities that burning of houses and killings resumed. As if that’s not enough, the soldiers went about unleashing a campaign of terror and intimidation against Jukun people, breaking into homes and confiscating hunting dane guns, cutlasses, bows and arrows, and left the Fulani herdsmen fully armed with their weapons to continue their campaign of terror in the countryside. Benjamin alleged that close to 50 villages in southern and central Taraba exist only in name as Fulani herdsmen have wiped out the indigenous population and are commandeering the villages. Chief Ogbebor said Gen. Danjuma ought to be taken seriously. She said killing in various parts of the country had become unbearable. Her words: “Gen. Danjuma is one of our topmost military officers since independence. He has always been in the system. He is so entrenched in the armed forces that he played significant roles at every point he served the country. She said there were too many arms and ammunition in circulation, stressing that the government must redress the situation to make life better for the people. “I am not a politician, but if we are not allowed to have a level playing ground through peaceful co-existence, violence will definitely set in. There is so much money and guns out there. We know that what General Danjuma said could happen. We don’t want Nigeria to become Somalia. “I call on all mothers of this nation, not only to pray, but come out and tell leaders to drop their greed and join in the fight against corruption.